Good Stuff NW: Brussels Sprouts? Burn 'em! And no, I don't mean at the stake, though served with a nice steak might be just the ticket. Here contributor Jim Dixon of Real Good Food extolls both his love for this brassica and his penchant for getting a certain reaction. Of all the Brassicas, Brussels sprouts caramelize the best (or maybe it's the Maillard reaction; food chemists can sort that out). When I want to cook sprouts, "burning" is my first choice. Cut them in halves or quarters lengthwise (I like quarters since they provide two flat surfaces). Use a heavy skillet, preferably cast iron, that's big enough to hold the sprouts in a single layer. Heat enough extra virgin olive oil to cover the bottom of the skillet over medium high for a few minutes, then add the sprouts (include any bits of leaves that might come off when you're cutting them). Use tongs or your fingers (carefully!) to arrange them so a flat side is down, then cook for about 5 minutes. They start to color very quickly. Turn them over and brown the other flat side for awhile, then go ahead and stir randomly every few minutes. When they're very brown or even slightly burnt looking, add a sliced red onion (or any onion, but I like red onions with sprouts) and a good pinch of salt. Turn the heat down a little and cook for another 10 minutes or so until the onion is soft. At this point you have a few options. A drizzle of honey is a good one, especially if you also add something spicy (red pepper flake, a little cayenne, or hot sauce). A splash of Katz vinegar with honey or cane syrup provides the sweet-sour flavor of agrodolce. Whole grain mustard, using a fair amount, like a quarter cup, makes some of the best Brussels sprouts ever (let it cook for about 5 minutes at the very end). 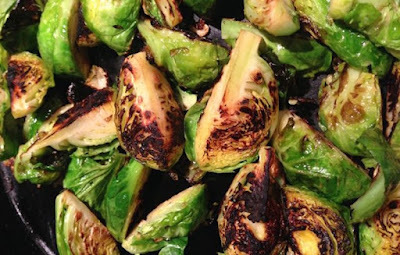 If you can find vincotto, drizzle a little over the sprouts; traditional balsamic vinegar is even better. You may never roast Brussels sprouts again.